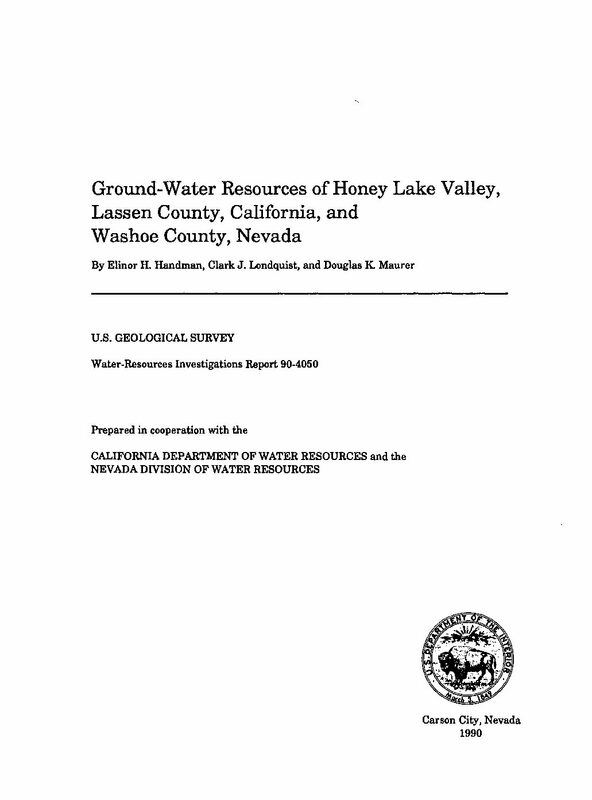 Honey Lake Valley is a 2,200-square-mile, northwest-trending, topographically closed basin about 35 miles northwest of Reno, Nevada. Unconsolidated basin-fill deposits on the valley floor and fractured volcanic rocks in the northern and eastern uplands are the principal aquifers. Ground water in the Nevada part of the basin is being considered as a potential source of public supply to the Reno area. This report describes the ground-water resources of the basin and the potential hydrologic effects of ground-water development in its eastern part. During an average year, about 1.1 million acre-feet of precipitation falls on the 1,700-square-mile study area within the valley, and an estimated 86,000 acre-feet enters the study area as streamflow in the Susan River and Long Valley Creek. Almost 90 percent of this water runs off, evaporates, or is transpired by plants before it can infiltrate and become ground-water recharge; this includes about 130,000 acre-feet per year that reaches Honey Lake as surface-water inflow. About 130,000 acre-feet recharges the aquifer system annually, about 40 percent by direct infiltration of precipitation over the study area and about 60 percent by infiltration of streamflow and irrigation water. Balancing this is an equal amount of ground-water discharge, of which about 65 percent evaporates from the water table or is transpired by phreatophytes, about 30 percent is withdrawn from wells, and about 5 percent leaves the basin as subsurface outflow to the east. A ground-water flow model of the eastern part of the study area, where withdrawals for public supply have been proposed, was used to evaluate components of the water budget and to estimate the long-term hydrologic effects of hypothetical increased development. Results of the evaluation indicate conditions under which a new equilibrium would be established if 15,000 acre-feet of water were withdrawn from the Fish Springs Ranch area annually. The model indicates that, as a result of such an increase in pumpage, water levels would decline more than 100 feet from present (1988) levels in the vicinity of the pumping, and as much as 40 feet at the California-Nevada State line. Evapotranspiration and subsurface outflow to the east would each be reduced by about 60 percent, but hydrologic effects would be minimal at the western boundary of the flow-model area (just east of Honey Lake). Within the modeled area, the simulation indicates that the increased withdrawals would cause the net flow of ground water eastward across the State line to increase from about 700 acre-feet per year to about 2,300 acre-feet per year.